It’s great that there is a group which is now regularly presenting opera at the Edmonton Fringe. The Fringe is definitely not the place – or perhaps the mindset – for large-scale opera productions (even if they were affordable), but it definitely is the place for enterprising groups willing to fit their productions to the spirit of the Festival, and that’s exactly what Pop Goes the Opera! 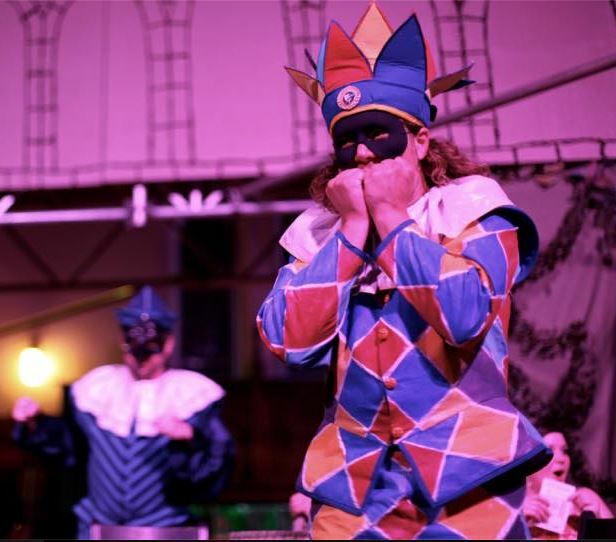 have done in their new production of Leoncavallo’s Pagliacci, which opened at Holy Trinity Anglican Church on Friday (August 17) and runs until August 27. The opera, which Leoncavallo claimed was based on an incident in his childhood (a murder case heard by his father, a judge), was the composer’s 1892 response to the success of Mascagni’s revolutionary 1890 one-act opera, Cavalleria rusticana (which Pop Goes the Opera! presented at the Fringe last year). The two operas are, of course, regularly given as a double bill. Both operas were in the new style of verismo, that eschewed the epic, historical, or sentimental subjects that had been the staples of Italian opera. No grand figures here – just slices of incidents in the lives (or supposed lives) of ordinary people, the kind of people who had rarely starred in Italian opera before. The action is swift and compressed, the colours bright, the emotions raw and essentially uncomplicated. Pagliacci is set in a small village in Calabria, and is at its base a love-triangle story, but with a couple of twists. There is a third man involved in the love relationship – the deformed fool, Tonio – and the plot revolves around the visit of a commedia del’ arte group who have come into the village to present the Columbine story. That story – of Columbine, married to the clown figure Pagliaccio, but with her sights set on her lover – exactly matches the real situation, which ends in a double murder. Art and reality get confused, and the villagers themselves – rather innocent souls – get increasingly confused between the two. There is a sense in the opera (among some wonderful and unforgettable music) that we, as “sophisticated” opera lovers, are spying on a more naive and simple world. That world is usually seen in the hands of professional opera singers in large opera companies. But it is one of the strengths of this most enjoyable production that the parts are not taken by professional opera singers, but by members of the Edmonton community putting on their own show. None solely sing as their career: for example, Bertrand Malo, the Tonio, is an Alberta prosecutor, Cristina Weiheimer, the alto playing Nedda, is a business analyst with the Government of Alberta, while Francis Price, QC, singing here in the chorus but also supporting the production financially and as one of its producers, is a Chartered Arbitrator. That does not, though, mean that they are entirely amateur in their music making, for almost all the soloists and the excellent chorus sing regularly in the Edmonton Opera Chorus, and Malo has taken minor roles with the company. So they all have experience, know exactly what they are doing, and clearly have enormous fun doing it. The result gives an extra layer to the whole proceedings, that really works: not only are we seeing a play within a play, but these are set within another (real) local community who are playing the local community of the village. The set is simple, with a neat scaffolding arch creating a second level, and the church of the opera happily melds into the real church that the audience are in (to take the correspondence further, the Rector [vicar] of Holy Trinity Anglican Church appears as the priest in the opera). The dressing of the scaffolding set could have been more inventive, but the whole arrangement happily accommodates the villagers and the plot. The period is ostensibly updated to the present-day, but apart from a series of mimed comments on the use of cell-phones, the production is essentially and sensibly period-less. The orchestra is cut down to flute, oboe, clarinet, horn, trumpet, and cello, with a piano playing the string parts. Again, this worked, the woodwind and brass providing the emotional colour, and the whole ensemble being large and accomplished enough to be effective, creating a chamber version of the opera. Sara Brooks, the conductor, kept the pace going except in the Columbine play-within-a-play, where the tempi were a little too slow to allow the comedy to emerge, or the tension to be built. Central to this production was the Tonio of Bertrand Malo, and it was good to see him in a more extended role. He has a rich and expressive bass-baritone, and he played the role as a kind of evil mephistopheles, at times a stalker, at times a manipulator of the action. It was appropriate that he should say the last line (“The comedy is finished”) – these days it is usually given by Canio (the Pagliacci) – because Malo was, intentionally, the real outsider in the village, while pulling the strings. Andrea Pinna is a kind of throw-back to an earlier age of Italian tenors: it is a huge and attractive voice, but one that has but one mode (loud), and I am sure that he himself would not claim to be the world’s best actor. But his stage presence is commanding, and a stand-up-and-sing style suits the part of Canio. Cristina Weiheimer was more convincing as Columbine than as Nedda – for the later it felt as if she could have used a bit more stage direction and development of character. I wondered if she was under-rehearsed, and she may well develop that character as the run of performances continue. The other solo roles maintain the overall high standard, backed by the excellent chorus. Those involved in the love-triangle are often played as if they are all young lovers (regardless of the actual age of the singers), caught in the passions of irresponsible youth. Here, one got the sense that they were in an older age bracket – their thirties, perhaps – and again this suited the work, as the feeling that none of them could claim the innocence of youth added a deeper dimension to the relationships. What the entire cast does convey is their sheer joy and enthusiasm in presenting the opera. Pop Goes the Opera!’s Pagliacci is a really entertaining evening, a swift (75 minutes) of operatic enjoyment. Opera lovers will find that the cut-down version holds it own, and those who have never seen an opera will experience a theatrical and music evening without that pomp and circumstance that sometimes goes along with the genre. The opera is sung in Italian, but there are excellent English translations projected onto a screen beside the stage (though these were obscured unnecessarily in the opening chorus, something I trust will be rectified). All in all, strongly recommended!